The J. B. Mitchell school building was erected in 1955, commemorating architect J. B. Mitchell, and was opened at a ceremony in June 1956. 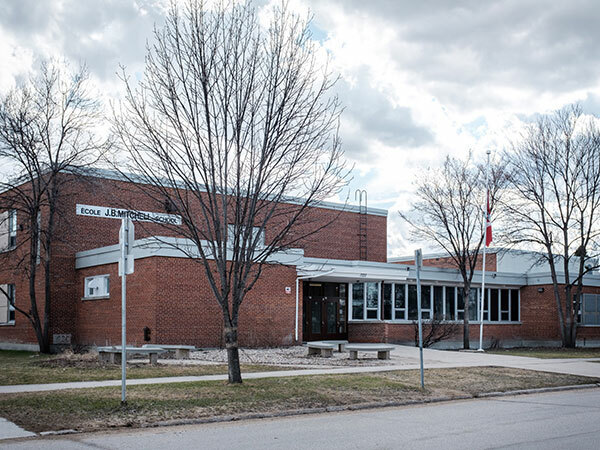 A junior high school until 1989, when it closed due to declining enrollment, it was used in 1990 to temporarily house students from Laura Secord School displaced by renovations. It reopened as a K-6 school in September 1991. “20 school board appointments made,” Winnipeg Free Press, 20 May 1971, page 3. “New Principals named for five city schools,” Winnipeg Free Press, 21 June 2005, page B6. J. B. Mitchell School fact sheet, Winnipeg School Division. We thank Nathan Kramer and Christine Loff for providing additional information used here.